Book review: Eco Warriors to the Rescue! Reviewed by Rebecca Newman. (A review copy of this book was provided by the publisher.) This post is part of a Blog Tour celebrating the publication of Eco Warriors to the Rescue! You’ll find other stops on the tour here. Take a sneak peek at some of the pages inside the book, over at the author’s blog. Get your entry in by 9am EST on Monday 9 September 2013. We will put all the entries into a hat and draw one winner on Monday 9 September 2013, and announce it here on the blog. Entries must be emailed by 9am EST on 9 September 2013. We will announce the winner (first name and state only) here on the blog on 9 September 2013. We will email the winner on 9 September 2013 and post the book to them by the end of September. We will post the book to the winner even if we have no response to the email. Entries that do not include a postal address will not be eligible for the draw. We will not pass your details on to any third party except when required by law. This giveaway is open to Australian residents only. Schools are welcome to submit an entry. You may only send one entry in per person for this giveaway. ATTEND THE LAUNCH OF THE BOOK! 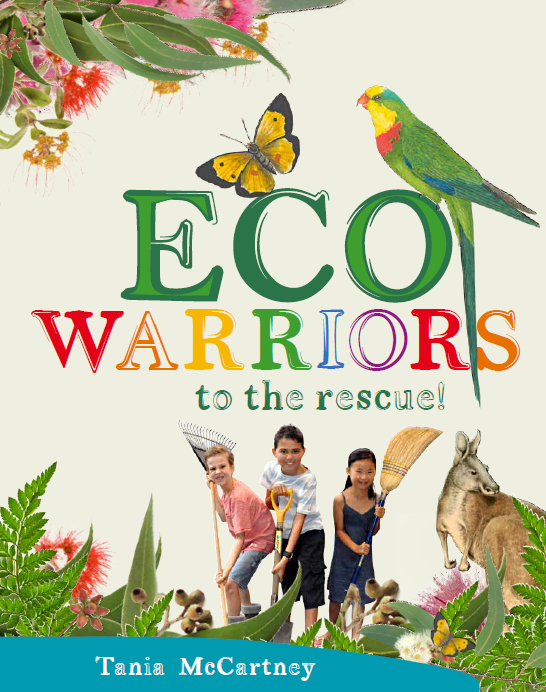 If you live in Canberra, you can Join Tania McCartney and her three real-life eco warriors — Banjo (Riley), Ned (Andrew) and Matilda (Claire) — as they launch Eco Warriors to the Rescue! at Canberra’s National Arboretum Gift Shop, Saturday 5 October 2013, at 11am.